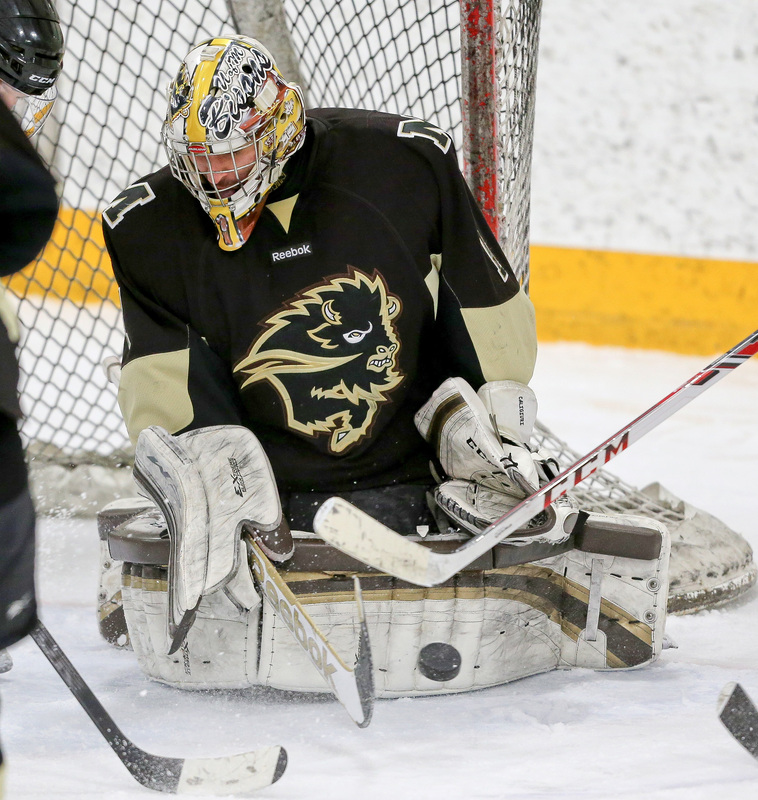 This weekend, the University of Manitoba Bisons men’s hockey team played a full three-game quarterfinal series against the Calgary Dinos. After winning game one on Friday, the Bisons dropped two straight and lost the series 2-1. The Dinos dominated the majority of the first period, outshooting the herd 12-2. Manitoba led at the break, however, after Joel Schreyer grinded along the boards and was able to feed a pass to Warren Callis, who finished the hard work off. In the second period, the Bisons jumped out to a 2-0 lead after Shaq Merasty stuffed the puck past Steven Stanford after taking a couple whacks at it. A minute later, Brett Brooks gave the home side a 3-0 lead after using his speed to tuck home a nice wraparound effort. Calgary cut into the Bisons’ lead after Elgin Pearce cruised into the offensive zone off a faceoff and dragged Justin Paulic across his crease and put it over his shoulder. A scoreless third period saw the Bisons fend off some furious pressure in the dying minutes of the game from Calgary to take the win 3-1. On Saturday, the Bisons were hoping to close out the series early against the Dinos with a win, but Calgary forced a decisive third game with a 2-1 victory. The Bisons were in control for most of the first period, generating a few grade-A chances from dangerous areas. They were unable to bypass Stanford, however, who made some excellent saves. A hard-hitting and fast-paced second period saw the game’s first goal with two minutes remaining in the frame as Pearce tapped the puck home after a great feed from Chris Collins at the point. 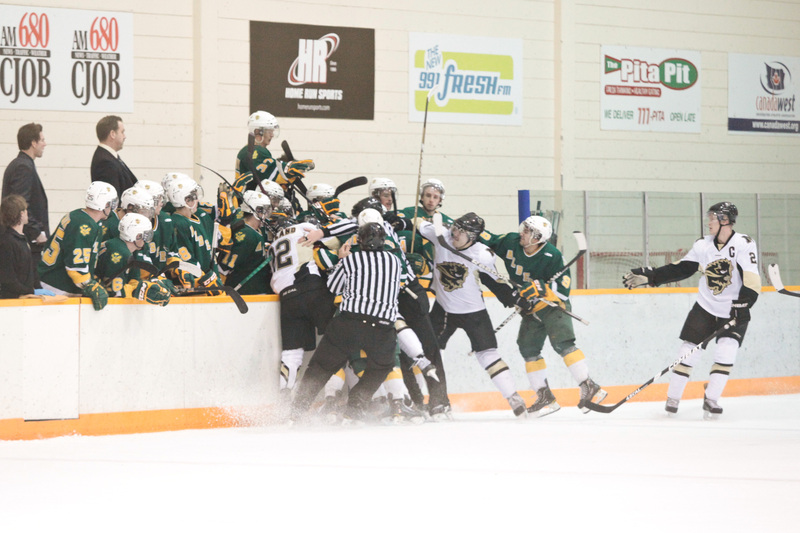 Both teams had strong chances throughout the second, with a couple of mad scrambles that had the fans at the Wayne Fleming arena on the edge of their seats. The Dinos jumped to a 2-0 lead 16 seconds into the third period with Pearce’s second of the night and third of the playoffs. Manitoba answered back when Brett Stovin finished off a nice passing play between Jordan DePape and Adam Henry on the powerplay. The herd poured some serious pressure onto the Dinos, but Calgary did an excellent job of blocking the shooting lanes to preserve the win. 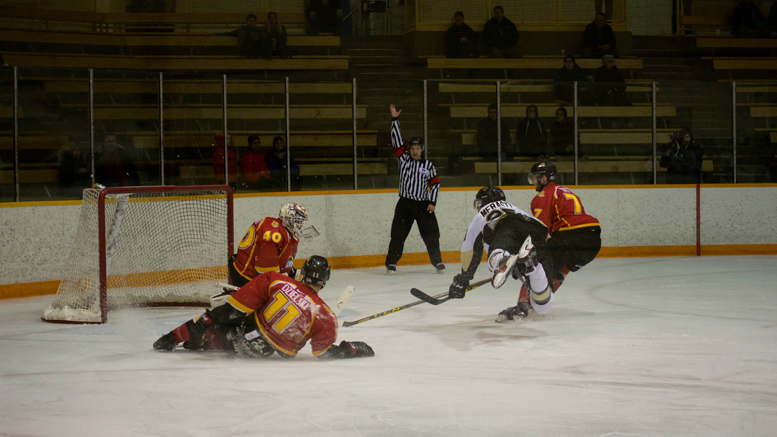 Sunday saw the Bisons and the Dinos face off in the decisive third game of their Canada West quarterfinal series. Calgary cruised to a 6-1 win, eliminating the herd from the playoffs. The first period didn’t bode so well for the Bisons, as they found themselves 2-0 down after Calgary struck twice on the powerplay through Spencer Edwards. Manitoba got their breakthrough four minutes into the second period off the rush when Jordyn Boyd fed a nice pass to Justin Augert, who tapped home his first of the playoffs. The Bisons continued to press for the equalizer but to no avail. The Dinos gained a 3-1 lead early in the third when they scored another powerplay goal. A couple minutes later, Collins picked up his own rebound and scored on Paulic from a sharp angle. The visitors added two more goals to make it a resounding victory for their squad. “We’re feeling a lot of pain right now, but the pain we suffer now will only make us stronger for next season,” Sirant said after the Bisons’ crushing defeat.